Yippee, just in time for the weekend, I am starting to feel human again! 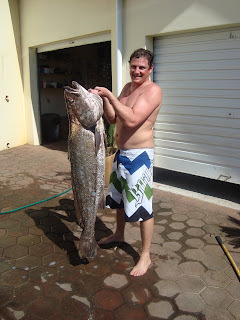 I will fill you in on what we get up to next week, but in the mean time I have to share the 'catch of the day' with you. 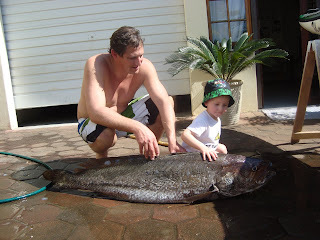 This is what Frank caught this morning, just off Toti Main beach, it's a salmon of 22kgs!!!! I don't know why my pic's don't seem to be the greatest quality at the moment, but it's the same camera? Anyways, I am off to buy some groceries.